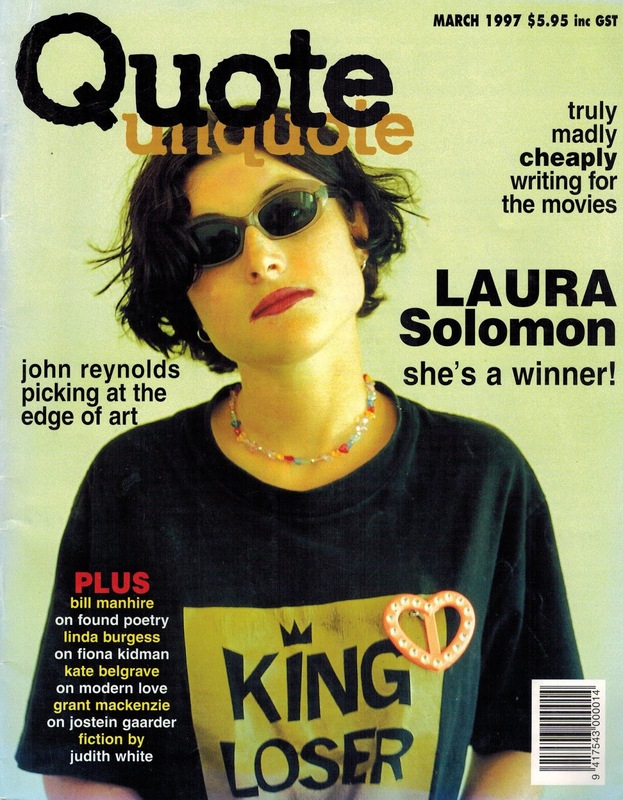 The writer Laura Solomon died on Monday, aged 44, of brain cancer. Her first novel, Black Light, was published in 1996; her second, Nothing Lasting, in 1997. Since then she was incredibly prolific in fiction, poems and essays: the last book I have is the 2017 short-story collection Alternative Medicine but there is much more listed at www.laurasolomon.co.nz, where the first two novels are available as free downloads. Mark Amery talks to Laura Solomon, the new Wellington writer who makes Emily Perkins look like a grande dame. No more questions. Solomon (whom the press is enjoying describing in bold type as “only 21”) is speaking about been seen and read about in the media since her ﬁrst novel, Black Light, was published by Tandem last month. You couldn’t say, in this sort of situation, that she’s reserved. Solomon says she doesn’t see the point of paying too much attention to what’s written about her. Besides, she says, there are almost always mistakes. For instance, she notes, the stained threadbare carpet in the living room of her flat was described in one story as shagpile. Black Light was written while Solomon was completing a degree in English Lit at Otago last year. She’s written two books since, one of which, Nothing Lasts, will be published by Tandem early next year. The day we talk she’s all packed to move to Melbourne, where, she says, she’ll wash dishes if she has to in order to keep writing. “I’ve always written and I’ll continue to write. I wrote my name when I was three and never looked back. In fact, I’ll tell you my little story about my taste for the macabre,” she adds, starting to show her mastery of the interview game. Solomon may have a black side to her (as the title of her book suggests), have the ability to write well and the motivation to do lots of it, but she doesn’t want to be seen as anything but ordinary. She got published, she says, quite simply by writing a book, sending it away and getting it accepted. “If there’s some 14-year-old looking through a magazine, I just want to appear normal. If among the over-glossed anorexic Amazons there’s one decent-looking normal woman there, that’s a healthy way to appear. No make up, no silly poses. I’m just not doing it. Grotesque, maybe. But like a cup of cold sick? The things people say in interviews.